Four More Feet is a documentary about Randy Pierce, a totally blind hiker who takes on the challenge of hiking all of New Hampshire’s 48 four-thousand foot peaks in a single winter season. 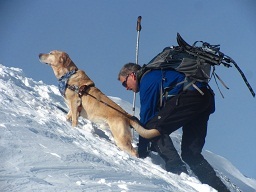 Aided by his service dog, “the Mighty Quinn” and several human guides, he has just three months to complete this quest. Far more than just their story, this film provides a powerful message of perseverance and more for all audiences. We are proud to announce free availability of this film in a format accessible to the Blind or Visually Impaired. Thanks to Producer Dina Sutin’s efforts, DVS is an optional format for the movie. We encourage the sharing and storing of this file with a request to credit 2020 Vision Quest and Dina Sutin! We are thrilled with the opportunity to share an incredible story with a powerful message. We hope you too will share this with everyone for whom you believe this may make a positive impact!